Cutter Slitter Creaser – THERM-O-TYPE Corp. – Competitive models offer limited finishing capabilities on stocks up to 13 – 15 pt thick. 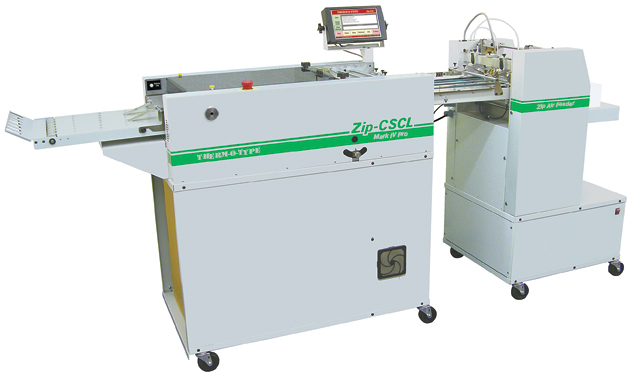 The heavy-duty Zip-CSCL Pro can run stocks up to 18 pt. and can add up and down cross creases in a single pass. Auto Adjust cassettes allow one across, two across and single fold card widths to be accurately adjusted using the touch screen computer. Optional Auto-Adjust rotary tooling cassettes can be run on Zip-A3E, CSCL and TS2L models. Auto Adjust product width adjustment can be made .001″ increments.